An exceptional plant with very striking foliage of burgundy with mint and silver chevrons, aging to dark green with red chevrons. Many white blooms are a wonderful contrast to the foliage. Red Dragon Fleeceflower is an herbaceous perennial with a ground-hugging habit of growth. Its relatively coarse texture can be used to stand it apart from other garden plants with finer foliage. This perennial will require occasional maintenance and upkeep, and is best cleaned up in early spring before it resumes active growth for the season. Gardeners should be aware of the following characteristic(s) that may warrant special consideration; Spreading Red Dragon Fleeceflower is recommended for the following landscape applications; General Garden Use Mass Planting Groundcover Naturalizing And Woodland Gardens Bog Gardens Container Planting Plant Characteristics: Red Dragon Fleeceflower will grow to be about 3 feet tall at maturity, with a spread of 3 feet. Its foliage tends to remain dense right to the ground, not requiring facer plants in front. It grows at a fast rate, and under ideal conditions can be expected to live for approximately 10 years. This perennial does best in full sun to partial shade. It is quite adaptable, prefering to grow in average to wet conditions, and will even tolerate some standing water. It is not particular as to soil type or pH. It is highly tolerant of urban pollution and will even thrive in inner city environments. This plant can be propagated by division. If leaf color fades in summer heat, just cut back for renewed vibrant color! Space 12–18 inches apart. Perennial. In spring, the fresh burgundy leaves on reddish stems are marked with a dark centre surrounded by a silvery chevron. As summer progresses, the leaves may become greener but they still have some dark hues and markings. The flowers are insignificant. It needs to be pruned back hard in late winter to allow the new leaves to develop. It may need support from cradle stakes when in full growth and can be trimmed back a bit at any time when it seems to have outgrown its spot. It can grow in sun or part-shaded sites and tolerates most soils. The colour of the leaves complements nearby hot-coloured or blue flowers, and it combines well with silver foliage (such as Plectranthus argentatus) to echo its markings. It also makes a dramatic contrast to gold-leaved plants, such as Duranta 'Sheena's Gold'. 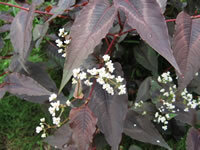 It grows very readily from cuttings taken in spring or autumn and the foliage is useful in flower arrangements. From the late plantsman Greg Speichert comes this fabulous perennial, which emerges in spring with dark burgundy-red stems that form a 3-4' tall x 4-5' wide plant. Each stem is lined with exquisite, tricolor, chevron-patterned leaves of purple, silver, and green. From midsummer through fall, the tips of the plant are covered in tiny, white baby's-breath-like flowers. Persicaria 'Red Dragon' is great in the perennial border as well as in a mixed container planting. In climates with hot nights, the intensity of the leaf coloration will not be as dramatic. Persicaria 'Red Dragon' is not a runner, but tips that touch the ground may root down if the soil is moist. Western cottage garden. Soil Requirements: Average garden soil to well amended soil with good drainage. Water Use: Medium water-use. Mulch: Organic. Maintenance: Cut back and clean up once it freezes. Top dress with 1 inch of compost spring and fall. Plant Characteristics Height/Width: 3’ – 4’ tall/3’ – 4’ wide Flower/Foliage Color: Indistinct white flowers. Showy green and red spear shaped and toothed leaves. Red veining and coloration in the leaf center. Flower Season/Duration: Leaf coloration all season long, white flowers from mid to late summer. Mature Shape: Tal, upright herbaceous perennial. 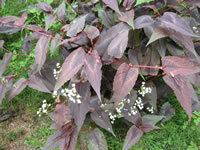 Remarks: The most remarkable quality of Red Dragon Persicaria is its burgundy red patterned leaves and red stems, a plant grown much more for its foliage than flowers. (The flower stalk in the upper right is of Acanthus spinosus.) Not a native (native to China) it will come back if nipped by a late frost and will suffer sunburn in afternoon sun. Red Dragon may take 3 years before flowering, however, that is not a drawback.